How to start a blog is a question that lots of new webmasters encounter. And this guide will be all about that! Personal growth. Many people start a blog as a way to express their ideas and deepen their knowledge. A well-established blog can be a showcase of your skills and expertise whenever you’re looking for a job or freelancing. More people will know about your brand. If you run a business, big or small, spreading brand awareness is going to be an important part of the journey. With the right execution, a blog can take your business to new heights. Blogs have the potential to become a user acquisition platform. When it comes to attracting new users, many acquisition channels require you to invest a lot of money (for example GoogleAds). While growing a blog may take time, once the traffic starts to kick in, you’ll have a solid platform that can drive new sales and improve conversions. Increased visibility in search engines. Blogging is one of the top ways to get more out of organic search. Remember, maintaining a steady flow of traffic is a vital part of any online project! Though it does require dedication, time, and proper preparation. But the very fact that you’re looking up how to start a blog means you’re on the correct path! Which blogging platform is the best for a new blog? How to choose the right web hosting. How to set up your blog and succeed. Before that, let’s talk deals! If you’re eager to start your blogging journey right away, claim this special discount and launch a blog with Hostinger today. 30-days money back guarantee included! To break the ice, let’s see what it takes to launch a blog from scratch. We’ll overview them in more detail and provide you with some cool tips that will make your blog stand out from the rest! If you’re running a project or business, blogging about the services, products, and company goals is a great approach. That way, you’ll attract people that are actually interested in what you do. A win-win for everyone! In case you’re looking to start a blog as an individual, a more extensive choice of options is at hand. The world full of possibilities surrounds you. From travel, technology, news to food, music, shoes – there are many things that you can pick as your primary blog topic. Since it’s one of the most important steps, try to avoid rushed decisions. Take some time to research your options and finding a blog niche will be much easier! Though ultimately, your best bet is writing about something that you like. When doing something you enjoy, the results are always better. And your audience will undoubtedly notice that. If you’re not yet sure what to blog about, don’t let it hold you down. Most successful blogs tried numerous approaches and topics before they reached the goal. Our best advice is to dive deep and never look back! The next step is choosing the platform where you’ll do all the work. Since blogs are mostly made up of content, you should consider using a content management system (CMS). Set up a blog without coding knowledge. Conveniently publish and create new content. Focus more on writing rather than technical aspects. Add new features easily with the help of plugins and modules. Find a gorgeous website design from a huge library of free themes. Not only that, but content management systems have gained quite a popularity. They power a big part of all websites around the globe. As you can see, there is quite a large selection of them. And there are a few contenders that stand way ahead of the crowd. The most awesome part is that you can install all these platforms with just a single click on Hostinger. No extra effort needed! Let’s overview each one in more detail to find the right pick for your blog. Holding the title as the world most popular CMS, WordPress is a solid platform to start your blog. It’s extremely easy to set up, use, and requires no coding knowledge! In fact, we use WordPress to power our blog and tutorial platforms here in Hostinger. Huge library of free plugins and themes. Requires maintenance from time to time. Joomla is another open-source platform that powers many blogs all around the globe. It’s also one of the biggest WordPress competitors. Setting up the CMS is quick and you can get away without having any coding knowledge. Some even argue that publishing content is easier with Joomla than it is with other platforms. But you can be the judge of that. With an extensive collection of free extensions and plugins, Joomla is a reliable place to start any type of blog. Beginner friendly. Less flexible compared to WP or Drupal. Intuitive admin dashboard. Had security flaws in the past. One of the more advanced content management systems, Drupal holds a special spot in the heart of every web developer. It offers some of the highest customization options when it comes to implementing complex features. Though you will have to possess the knowledge of how to do it. If you like coding and want to have a highly flexible blog, Drupal is the perfect match! Developer focused. Harder learning curve. Has the potential to add complex functions. Requires technical expertise. Flexible and secure. Smaller community. How much traffic do you expect? How quick is the setup? What features will you get to make your blog stand out? The cool thing is that you won’t have to look far, as we have exactly what you’re looking for! Here at Hostinger, we’ve extensively perfected the server infrastructure over the years to provide the best blogging experience. Empowered with a handcrafted Hostinger control panel, you can set up your blog platform of choice with just 1-click. And whenever you need help, web experts will be at your disposal 24/7. For a flashy start, grab our special blog discount coupon and go online instantly! Not only that, but there are plenty of options to choose from, depending on the scale of your blog project. Let’s see what’s on the table! One of the best places to launch your first website or blog, shared hosting can be compared to public transportation or a student dormitory. It houses multiple websites within one physical server. All the resources (such as disk space, RAM, bandwidth) are shared among each site from a single pool. However, the servers are neatly optimized and monitored around the clock to make sure every website is up and running in full throttle! Affordable and easy to use. You’ll share server resources with others. Uptime and server updates are handled by the host. Limited configuration options. 24/7 live customer support. No root access. Features 1-click blogging platform installation. Catered towards business owners and larger projects, cloud hosting aims to provide the power of a virtual server while maintaining the simplicity of shared web hosting. It’s a solid and reliable platform to start a blog, as you’ll have lots of resources to handle whatever traffic is coming your way. In addition, all the resources are dedicated to you and no one else, thus you’ll have plenty of room for growth. Dedicated resources and IP address. Higher pricing compared to other solutions. 24/7 live customer support. Limited configuration options. Resources fully dedicated to you. No root access. Can seamlessly upgrade from shared hosting. VPS, short for a virtual private server, is a unique solution that brings more freedom and control to the table. Though if you’re not familiar with server management, this solution may be a bit tricky. If you aim to start a simple blog only, picking another solution would be better. But if you plan to get your hands dirty and launch many different projects, having a virtual server will let you set up the perfect environment. Grants root access. Requires technical knowledge. Dedicated IP and resources. Server management skills are a must. Offers the highest flexibility out of all solutions. Unmanaged. Gives you the most control. Has a higher learning curve. Ability to change any server-side settings. If it’s the first time you start a blog, the budget might not be there yet. Heck, it may even take some time before you test the waters and figure out what works. That’s why we’ll show you how to start a blog for free! Free hosting is the perfect testing ground for every new webmaster. And whenever you need more power, you can upgrade and seamlessly transfer your blog to our premium web hosting servers! Great testing environment. Limited resources and disk space. Easy to use. No email service. No setup cost. No live support (community forum). Every website has an address and so will your blog. Choosing a domain name can be tough, but it’s easier with Hostinger! If you order a web hosting plan for 12 months or more, we’ll throw in a .com; .net; .org; or .xyz domain name free of charge for the first year. But you can also buy them separately using our domain checker tool. Type in your desired domain in the search bar and you’ll see all the available options. 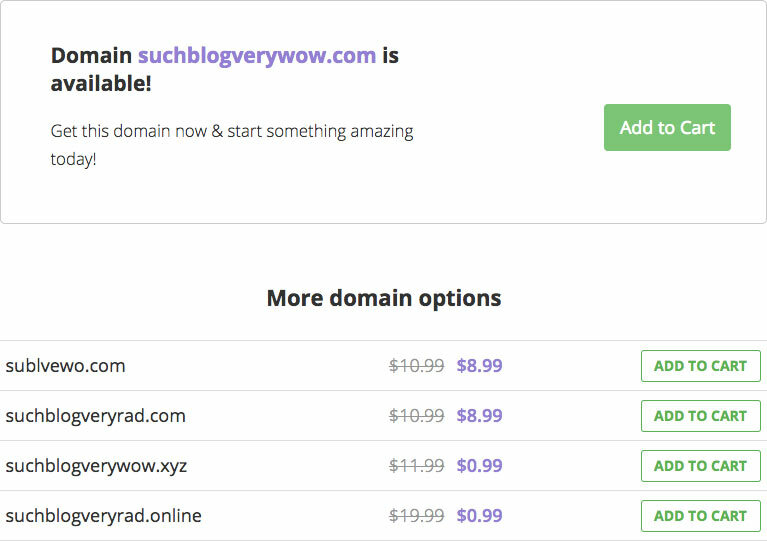 Consider checking our how to buy a domain name guide for more in-depth coverage. Once you have your web hosting and domain name ready, you’re just one step away from reaching the goal. Since we outlined three platforms to start your blog, let’s see how to perform the initial setup with each one. Since WordPress is so popular, let’s see how to start a blog with it first. Setting it up is quite simple. Especially if you’re using Hostinger. All you have to do is navigate to the Auto Installer section in the control panel. Select WordPress and follow our simple three-step setup wizard that will get the job done. To make your blog management easy, WordPress provides an intuitive dashboard. You can access it by typing yourdomain.com/wp-admin in the browser. In the Appearance section, you can find many free themes and choose a stylish look. If you have difficulty choosing, check out our collection of the best free WordPress themes. The Plugins section offers of a large library of free extensions. You can view them as add-ons that extend the functionality of your blog. Oh, and did we mention? All of them are absolutely free! Yoast SEO will let you optimize your posts much easier with the latest SEO practices. Akismet Anti-Spam will keep your comment section clean and spam-free. Jetpack offers a bundle of features related to security, performance, statistics and more! Meanwhile, the Posts section will be your most visited area, as all new blog posts will be created there. For a more detailed approach, consider reading out WordPress tutorial for beginners. Next up is Joomla, the second most popular CMS to start a blog. On Hostinger, setting up Joomla is a walk in the park. All you need to do is follow the installation wizard found in the Auto Installer section. Once done, navigate to yourdomain.com/administrator URL to access the Joomla administrative dashboard. If you head over to the Templates section, you’ll be able to customize the look and design of your pages. In case you want to manage functions or features, the Modules section is the place to go. K2 is an extension that aims to improve article management with extra features and enhancements. EasyBlog is another extension, which aims to replace the default article system with a more efficient one. Komento helps you manage and moderate comments more effectively. And the most important part for every fresh blog – adding new posts. You can easily create them using the Articles section. For a closer look at Joomla and how to use it, you may check our Joomla tutorial for beginners. Last, but not least, there’s Drupal. 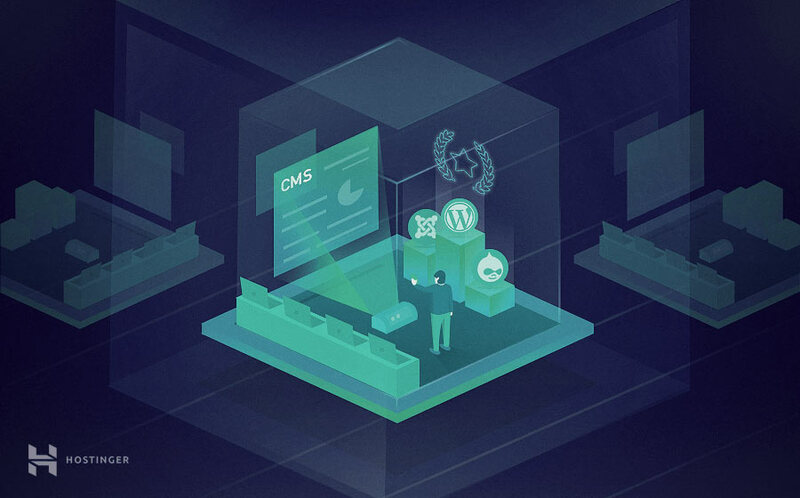 This CMS offers robust flexibility and can be a really powerful platform in the hands of developers. On Hostinger, you can set up Drupal with no fuss using the Auto Installer tool available at the control panel. Head over to yourdomain.com/user/login to reach the Drupal admin dashboard. To change the look and design of your blog, navigate to Appearance section. In the Extend tab, you can implement new features and functionalities with modules. Admin Toolbar replaces the existing toolbar with a more flexible one. ShareThis lets you easily share posts to various social media platforms. Image Effects allows you to add eye-catching effects to images in your blog posts. And finally, the Content tab is the place where you can create new blog posts, pages, and everything else content related. For more in-depth coverage, you may check our Drupal tutorial for beginners. Hurray! You are now know how to start a blog using three of the best CMS platforms. The remaining part is picking the one you will use to create your blog. Personally, we’re huge fans of WordPress. As for this last step, it is fairly simple: publish, publish, and publish! Since content management systems let you create new posts without much effort, this is what your main focus should be: pushing out as much good quality articles as possible. Considering that it usually takes at least a couple of weeks before new publications start showing any notable results in search engines, the sooner you start – the better. Ideally, we want our blog to generate traffic and grow over time. To reach that, you’ll need to think outside the box and be prepared to work hard. Which is why we’ve prepared 10 of the best tips that will show you how to start a blog and succeed! No matter what you’re doing, having a well thought out plan is essential. Not only will it make your work and results more efficient, but will also give a clearer vision of where you’re headed. Most blogs generate new users through organic traffic. And the best way to do it is through high-quality posts. Hence, you’ll need to remember one golden rule: content is king. While search engine optimization may seem tricky, it’s actually one of the best skills you can acquire before you start a blog. Proper SEO can put you miles ahead of the competition while ensuring that your content stays relevant and noticed. 30 of the best WordPress SEO tips. Search Engine Optimization (SEO) Starter Guide by Google. How to learn the latest SEO practices (and stay sane). Ideally, your blog posts should target keywords and phrases that people look for while using search engines. Pumping out content without proper keyword research is like shooting in the dark. You might hit something, but you’re not exactly sure what. 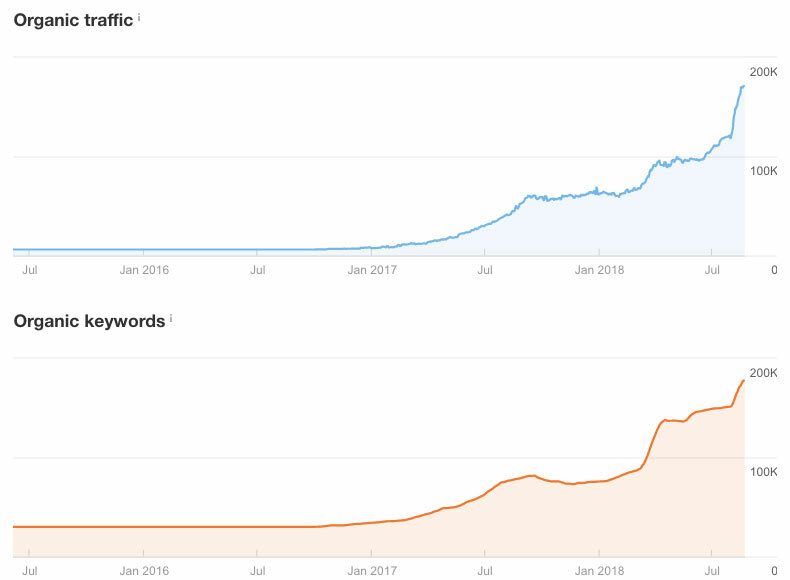 Understanding keywords, their search volume, and the content that currently ranks the highest can give you a pretty good idea of the search intent. Once you know that, creating a solid blog post will be much easier. For example, here’s the growth of our tutorial blog traffic in conjunction with the number of organic keywords. Our tutorial blog statistics show that organic keywords and the amount of traffic are closely related! Therefore, doing keyword research is an important homework that everyone looking at how to start a blog should do. How to use Google Keywords Planner. Google Trends (helps you see shifts in the popularity of phrases and search terms). Answer the Public (see what questions and queries are the most frequent in a search term). KWFinder (free tools that let you see search volumes and other useful statistics). New blogs can find it difficult to set the right direction. Though it’s always easier with a good example in front of you. Researching the best performing blogs in your niche is a great way to find new ideas for your own site. Firstly, gather a list of 5-10 blogs or websites that perform really well in your niche. Then, use such tools as SimilarWeb to generate a report. While the free version provides limited statistics, you can still see such metrics as top 5 organic and paid keywords. Once you’re done with the research, you should see a much clearer view of what content your blog needs. 4. Create a content plan. Grab a simple spreadsheet and brainstorm potential article ideas. Start with broader topics and make your way down to more specific branches. If you’re well-seasoned in a particular area, prioritize it first. Notable results will not come right away, so discipline will be your new best friend. Try to set deadlines for article publishing and monitor your overall progress. Aim to find the ideal balance between quality and quantity. Then, stick to your plan and leave some time to reflect on the results. 5. Set up social media platforms. Building an online presence is important, especially if you start a blog alone. But social media platforms make this task much simpler. Firstly, they will increase user engagement. You can notify people about new articles, plans, and updates. It’s also an amazing way to get acquainted with your readers. A crucial mistake that many new projects make is ignoring their audience and their needs. But with a Facebook and Twitter profiles in place, you can receive feedback from your readers directly. And as you grow, you may run into serious business offers or similar opportunities. Depending on the content that you produce in your blog, social media platforms may even attract new readers. It’s not only about gathering your existing audience. As people share your content, more and more people will be tempted to check it out. After you launch your blog, one of the toughest tasks will be making people notice it. Numerous competitors will stand in your way and you’ll need a lot of time to make it to the top results of Google. However, there are ways to make this journey less bumpy, and doing guest posts is one of them. Guest posting is a practice that many bloggers, writers, and business owners do regularly. Boost in SEO due to links from other websites. A slight increase in direct/organic traffic. If that’s something you’re willing to try, check out this in-depth guest blogging case study by Ahrefs. Monitoring your traffic is an essential part of building a successful blog. Knowing your audience and what they want from your site will put you a few steps ahead. And the best tool to take care of this job is Google Analytics. It tracks your visitors, their habits, various social metrics and more. What’s more amazing is that this software is completely free! This means that every webmaster can easily find out find out more about their readers. If you plan to start a blog using WordPress, our detailed guide on how to set up Google Analytics is just what you need. 8. Submit new content to Google. Thousands of new websites are created daily. And the number of new posts and articles must be in the millions. With that much action going on, it may take a long time before Google and other search engines start indexing your new content. But there’s a great shortcut you can take to speed things up! Get alerts in case of sitewide errors. And most importantly, you’ll be able to submit new blog posts and force Google to crawl them. If you want to reach the top results of Google search, backlinks are something that you’ll need to take seriously. In fact, it’s one of the most important ranking factors that Google takes in mind when evaluating websites. While new blogs should focus on producing content and improving existing pages, there will come a point when you’ll have multiple top-notch content pieces at hand. More often than not, even the highest quality content may not see the light of Google SERPs if you don’t work on your backlink profile. 10. Patience is the key. One important thing to remember: starting a blog is a long-term investment. Just as with any new activity, you’ll need effort and time to see any notable results. First and foremost, it will take time before Google starts recognizing the existence of your blog. Many SEO specialists claim that there’s a period of time that needs to pass before your content starts making an impact (also called Google Sandbox). So if you really want to succeed, arming yourself with patience is the way to go. Hope for the best, but be prepared for the worst, and you’ll surely get there. Whenever you do something new, this is the first question that you should find the answer to. Why? Once you uncover the reasons, the whole process will become way more enjoyable. And you might just learn a couple of new things along the way. You’ll build niche related knowledge. To create quality blog posts, you’ll need to study your niche and research many new areas. During this process, you will gather valuable knowledge which can help you in the future. Who knows, you might just uncover ideas great enough to start your own online business. It’s a great way to express your ideas. Do you ever have one of those days where many great ideas start flowing in, but there’s no way to act on them? Well, if you start a blog, that’s more or less taken care of. Share your insights and opinions with everyone around the world! You will build a consistent stream of traffic. Many new projects and businesses often struggle to find an audience to showcase their fresh ideas or products. This can cause slowness in growth and expansion. But with a blog in place, you can build valuable traffic and convert it into potential customers or users! New opportunities will show up. While the journey may be a little tough at the beginning, once your blog starts growing, you will stumble upon many new opportunities. As you establish your online presence, more and more people will join your circle. And you might just become the next big expert in your niche! Show the world what you’re up to. Even in this age of modern technology, the written word is still the most powerful way to get your message across. If you’re running a side project, starting a blog may be of the best ways to showcase your achievements to the world. Using the power of the internet, you can reach every corner of the globe instantly! Become the next big influencer. Every new blog post will get you one step closer to greatness. If you have lots of expertise in a certain area, blogging will help you establish yourself in the market. Build an audience, make new connections, present your ideas and break all boundaries! Work towards a dream. There’s no better feeling than working your way up towards a goal. Though a lot of times, we end up not knowing because we simply don’t try. If you’re passionate about something, making a blog will give you the perfect environment to start working towards your real passions. Years ago, blogging wasn’t viewed as something serious. But as time went, many people have turned their blog into a solid business. If freedom is something that you’re aiming at, running your own blog is a small step in the right direction. Congratulations! You now know all the proper steps on how to start a blog and be successful. The only part that remains is the execution, so what you are waiting for? Go online with Hostinger today! And if you have any other blogging related questions, inquiries, or tips, drop them down in the comments below. WordPress vs Medium ― Which One Is For You? How to Drive Traffic to Your Site? Gediminas is a passionate content writer and SEO geek at Hostinger. He started his journey at customer support and aims to use his gathered knowledge to create the most epic content the world has ever seen. From WordPress to server management, there's no topic he can't cover! He also likes cats. Wow, great read! I was looking up how to start a blog on Google and came across your article by chance. I will make sure to apply your given tips to my new technology blog that I plan to launch. Now I am very fired up. Thank you Hostinger! Thank you for sharing your experience, Lee! How to Become a Web Developer: Where to Start?